The MP525P makes the perfect projector choice for your everyday life - in business and education. Featuring an impressive brightness of 2500 ANSI lumens, a high contrast ratio of 2600:1 and a XGA (1024 X 768) resolution, the MP525P offers a stunning full-screen presentation with the finest details regardless of the ambient light level. 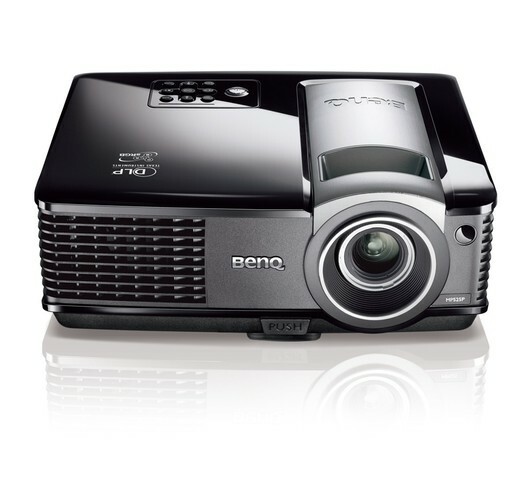 BenQ projectors that use DLP® technology are virtually immune to color decay – the yellow/green tint that some projector /images/product/projector/mp525 develop over extended periods of usage. Because DLP® projectors enjoy a technological advantage in protecting against color decay, they offer an extended lifespan – lasting year after year. BenQ DLP® projectors use a filter-free design to eliminate the need for filter cleaning and filter replacement, which not only reduces labor for support staff, but also saves money for companies or schools. The MP525P comes with XGA native resolution up to 1024 x 768. This brings you crisp and accurate /images/product/projector/mp525 in your every presentation! A 2500 ANSI lumens projection lamp ensures great viewing even is location with ambient light. The MP525 is ideal for small-sized meeting room with under 25 people. The high 2600:1 contrast ratio means fine details and subtle color differences are rendered vividly even in darkly lit scenes. BenQ projectors, the first to adopt BrilliantColor™ Technology, with BrilliantColor™ deliver unsurpassed color range, depth, and vibrancy far beyond the conventional color space to capture hard-to-produce vivid yellows, cyan, and magenta. BrilliantColor™ and BenQ breathe life into every image! Can't find a smooth white wall? Not a problem. BenQ's Wall Color Correction Technology offers a selection of five wall colors to meet the projection demands of various surfaces, even blackboards! Now you can get outstanding projection quality wherever you go. With build-in 2W speaker with the MP525P, not only do you get the vivid visual performance, you get the same audio satisfaction, too! With up to ±40° keystone adjustment, a perfect square is all you'll see. So go ahead and say goodbye to misshaped /images/product/projector/mp525, graphics, and charts! Have you ever missed a funny line during a movie because your companion starts talking to you mid-scene? With the MP525P, you can get subtitles even when you're watching TV! You'll never have to miss a line again!